Cub Cadet - Rare Bird Inc. They make robots that freaking cut the grass. We know, right? 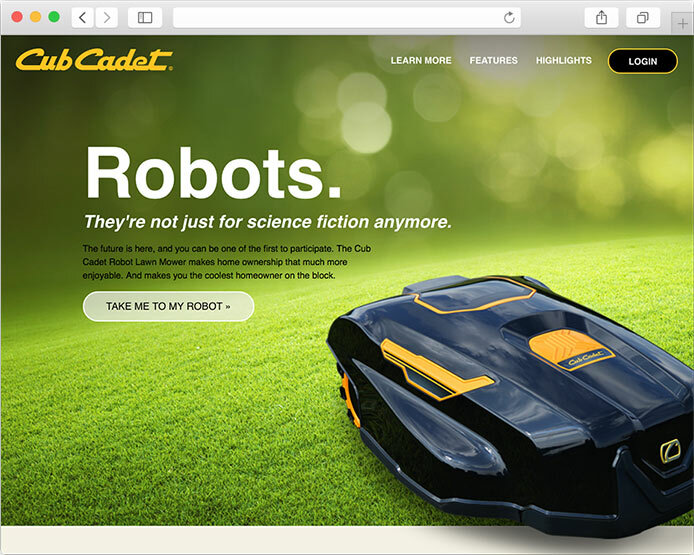 We’re obviously big fans of anything techie here, so when Cub Cadet approached us to build a website for not only their line of golf course equipment — featuring the RG3 robotic greens mower — but also a site for the beta testing of their residential robotics mower and a new scheduling tool — let’s just say there was a little bit of Nerdvana in our offices. Cub Cadet, well known for their quality lawn and industrial machinery, was branching out into a line of equipment created specifically for golf courses. The new shining star of that line, the RG3, needed to be showcased. 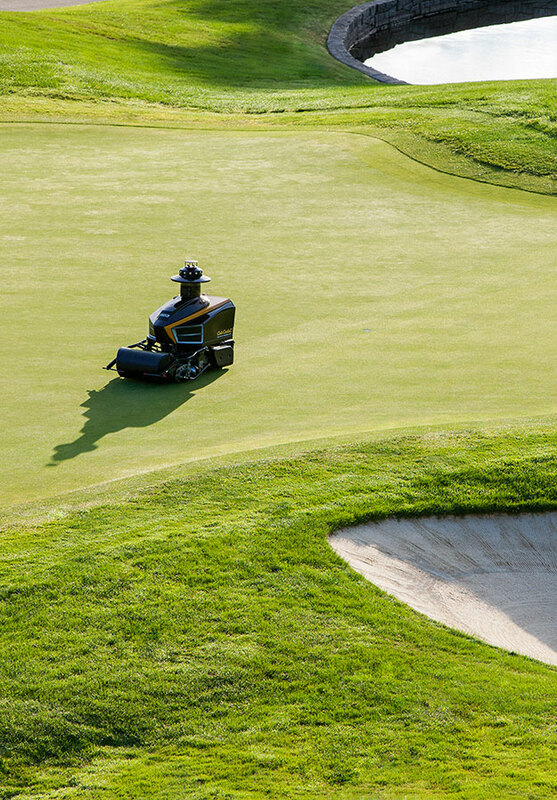 In order to adequately represent the amazing capabilities of this machine, and its significant time savings for golf course superintendents, we needed to understand how the robot operated. We didn’t want to just feature its features. We needed to show off its benefits. It came. It saw. It cut your grass. 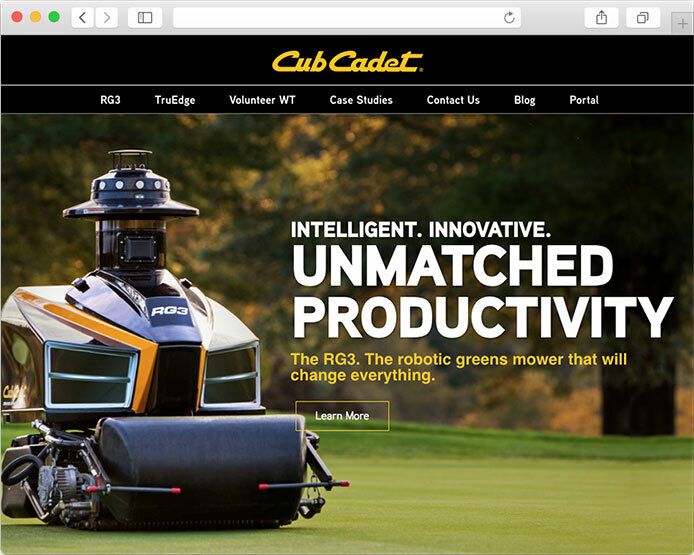 As we developed the Cub Cadet Golf site, we drew our inspiration from the look of the RG3 and other equipment, as well as the Cub Cadet branding. The result is a site that represents the equipment through beautiful photography, strong benefits-centered language and a futuristic feel. For both the beta-testing residential robotics mower site and the professional golf site, we created password-protected portals where users could post messages, receive updates, and view critical reports providing feedback (for the RG3) on functionality and ways to review — and possibly improve — efficiency. We converted the raw data from each installation and put it into a report format that was both appealing to review and provided actionable feedback. 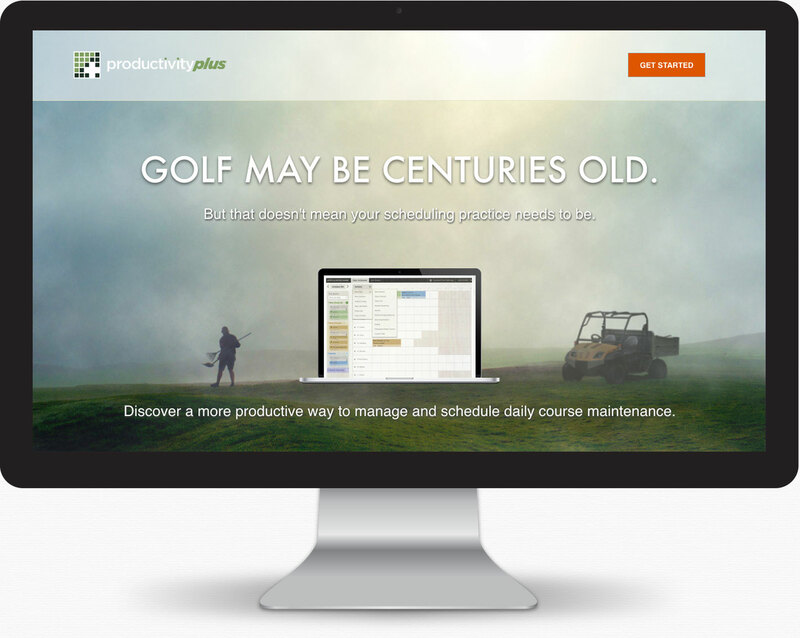 We also worked with Cub Cadet on an online golf course maintenance scheduling tool called Productivity Plus. Productivity Plus enables superintendents to leave the hassle of paper scheduling and the whiteboard in the past and embrace a tool that saves them both time and hassle. We designed the web site and will be implementing an online ordering mechanism to allow for purchasing and rapid deployment. Throughout the project, we worked closely with both Cub Cadet and the software engineers at Carmel based SEP, Inc. The end result was a machine as finely tuned as every other Cub Cadet product. It’s always a beautiful thing when innovation and creativity come together seamlessly. Kinda like sitting back and watching a robot cut your grass.